YAY- One of my favorite days of the year! 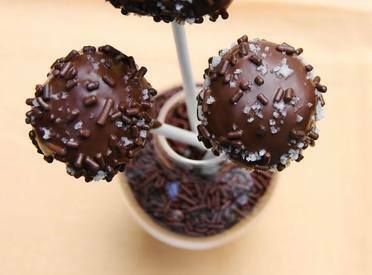 So, with that said...how about Salted Chocolate Cake Pops Dipped in Chocolate!! So how did simple chocolate cake pops turn into absolutely-to-die-for salted chocolate cake pops, you ask? Well, I had some fleur de sel out for sprinkling on my margarita cake ball truffles. What's a margarita without a little salt, right? So I wanted to get that salt element into my cake balls, too. And here's where the stroke of genius comes in - after dipping one of the chocolate cake balls into the chocolate coating and sprinkling on a few chocolate jimmies, I reached over into the fleur de sel and sprinkled it on top too.